Minimum 100, Custom printed with your artwork! 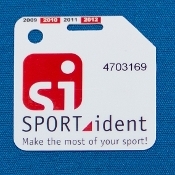 SPORTident 25cm elastic wrist band (like finger strap but longer). Or source your own solution to use with holes provided.